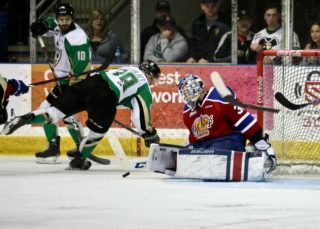 RAIDER REVIEW: The Raiders (39-5-0-1) visit Prospera Place tonight to take on the Kelowna Rockets (18-22-3-1) Last night in Kamloops, the Raiders won their fourth-straight game with a 4-1 victory over the Blazers at the Sandman Centre. Brett Leason had a goal and an assist in the win, while Sean Montgomery and Max Martin each picked up a pair of assists. Ozzy Wiesblatt, Dante Hannoun, and Justin Nachbaur also found the back of the net for the Raiders. Boston Bilous made 29 saves to pick up his first win as a Raider in his first start with his new team. For a full recap of last night’s game, click here. VS. KELOWNA: This is the only meeting of the year between the Raiders and the Rockets. 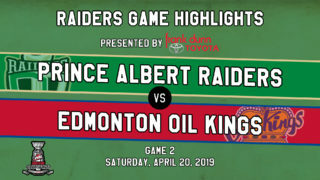 Last season, the Raiders dropped a 7-3 game to the Rockets at the Art Hauser Centre on the strength of Kole Lind’s hat trick. 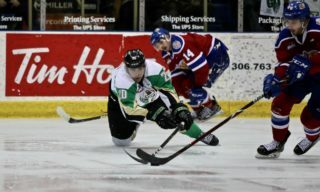 The Raiders’ last win over the Rockets game on Dec. 16, 2011 in a 3-2 shootout win in Prince Albert. The last victory in Kelowna was on Jan. 31, 2007 with Matt Robertson netting two goals and an assist in a 4-1 win. Raiders assistant coach Jeff Truitt was Kelowna’s head coach at the time. VS. BC DIVISION: This is the third of five games against the BC Division this year. 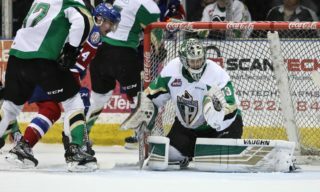 Last season, the Raiders posted a 3-1-1 record against the division last year by beating the Kamloops Blazers, Prince George Cougars, and Victoria Royals at the Art Hauser Centre. MILESTONE MARKER: Raiders overager Dante Hannoun scored his second goal as a Raider on Friday night. It was also the Delta, BC product’s 100th goal of his WHL career. Since joining the Raiders, Hannoun has two goals and three assists in seven games. In his 293-game career, the centreman has compiled 100 goals and 153 assists. SWEET SIXTEEN: With a goal on Friday night in Kamloops, winger Ozzy Wiesblatt has jumped to eighth in rookie scoring with 10 goals and 16 assists. The Calgary product is also the highest scoring 2002-born player in the WHL, taking sole possession of first in that category from Seth Jarvis of the Portland Winterhawks. FIRST THINGS FIRST: Brett Leason’s goal 28 seconds into the first period of Friday night’s game was the sixth time this season he has opened the scoring. The Calgary product leads the Raiders in that category. At the league level, Leason only trails the trio of Joachim Blichfeld, Connor Dewar, and Tristan Langan who all have seven. With an assist on Friday night as well, Leason is heating up again with six points (3g-3a) over the last four games. DOUBLING UP: Justin Nachbaur’s marker late in the third period gave him goals in back-to-back games for the second time this season and third time in his WHL career. The first occurrence this year was part of a three-game streak during a three-in-three weekend in September against the Medicine Hat Tigers, Moose Jaw Warriors, and Saskatoon Blades. NEXT UP: The Raiders are off until Tuesday night when they take a ferry to Victoria to play the Royals (22-18-1-0) at the Save-On-Foods Memorial Centre. Puck drop is 9:05 p.m. CST. 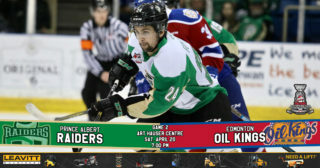 The Raiders return to the Art Hauser Centre for games against the Edmonton Oil Kings and Moose Jaw Warriors on Feb. 1 and Feb. 2, respectively. Tickets are available at raiderhockey.com and the Raider Office.